The volcano in Bali, Mount Agung erupted at 5.30 pm, Saturday, November 25, 2017. 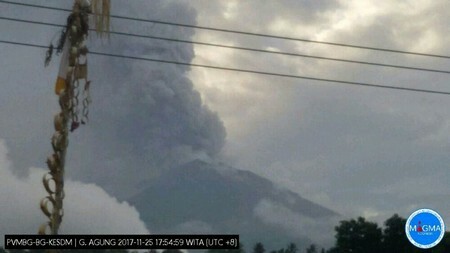 The eruption of volcanoes in Bali is marked by the release of blackish-gray smoke as high as 1,500 meters from the surface of the crater of Mount Agung. Smoke that emerged from the puncal of the mountain is very gray-black, medium-pressure. Previously the Center of Volcanology in Bali called the eruption that happened was phreatic eruption. But then the information was rectified. The eruption at 5.30 pm is an eruption. Seen on the volcano in Bali, Mount Agung, the smoke soars to the west weakly. But Meteorilogi Climatology and Geophysics Agency predicts wind direction will change to the east-southeast tonight. The government appealed to the public to remain calm and keep following the recommendation of the Center of Volcanology, because Mount Agung is still at level III status. From the top of the mountain is a red zone at a radius of 6 Km from the crater, and sectoral 7.5 Km from the crater. While the record for flights on volcanic activity is still orange, the plane is expected to stay away from the area of ​​Mount Agung, because smoke generated from the mountains can damage aircraft engines. The people of Bali who are near Mount Agung to avoid any activity within a 6 kilometer radius from the top of the mountain, plus a sectoral extension of 7.5 kilometers to the north-northeast, southeast and south-southwest. Since last October the volcano in Bali, Gunung Agung, has shown signs of eruption. Conditions that live near the mountain in the urge to move away from the mountain up to a radius of 12 km. But in early November, people have been allowed to return to homes near the mountain. The possibility that someday people will flee again, because eruption activity has occurred, the possibility of this volcano in Bali will erupt a bigger and dangerous.